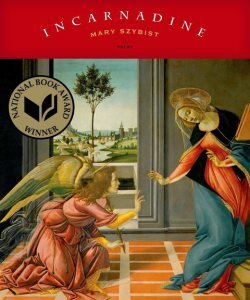 I would like to start off by saying that I highly recommend Mary Szybist’s second collection, Incarnadine, to any lover of poetry. I admit that I do tend to be one of those people who enjoy whatever I’m reading, but I honestly believe that this book has the capabilities to appeal to a variety of readers, not to mention the fact that it was a 2013 National Book Award winner. The poems are extremely diverse to the point that it is surprising that they work well together as a collection, but they do. The most obvious way in which they differ is in format. The poems come in prose form and blank verse, wide and skinny, long and short. There is one poem presented in a sentence diagram, and there is a circular poem that resembles a sun, in which the lines go outward from the center of the page. The poems also differ widely in content, though most of them explore the same topic, annunciation, in some form or other. There is an annunciation from blades of grass to a little girl, an annunciation about a Right Whale being attacked by Sea Gulls, annunciations from people to spirits, spirits to people, and, of course, the center piece of that exploration is the annunciation of the angel Gabriel to the Virgin Mary. But even this topic feels very modern and relevant. The result of these explorations are moments of beautiful clarity that portray a desire for contact or comfort, a desire to be sure of things that cannot be supported by evidence. Someday Mary would like to think about herself, but she’s not yet sure what it means to think, and she’s even more confused about herself. It is not uncommon to find Mary falling asleep on her yoga mat when she has barely begun to stretch. This poem stuck out in my mind as a vital part of the collection primarily because it draws a parallel between the character in the poem, Mary (perhaps the poet), and Mary, the mother of Christ. The Mary in this poem admits to thinking of the Virgin Mary when she hears her own name, and her implied connection to Virgin Mary seems to have implications on how she sees herself. Mary imagining “herself as a door swung open” suggests a desire to be open to the workings of God, though this idea is so vague and difficult to picture, Mary resorts to thinking of macaroons instead. I am looking at the postcard of Anunciación, the one you sent from Córdoba in the spring. I taped it to the refrigerator next to the grocery list because I wanted to think of you, and because I liked its promise: a world where a girl has only to say yes and heaven opens. But now all I see is a bright innertube pillow behind her head. All I see is a girl being crushed inside a halo that does not save her. This is what it’s like to be alive without you here: some fall out of the world. I fall back into what I was. Days go by when I do nothing but underline the damp edge of myself. What I want is what I’ve always wanted. What I want is to be changed. Similarly to the previous poem, this poem also draws a parallel between the characters in the poem, Mary and Gabriela, to the Virgin Mary and angel Gabriel. In this poem, Mary seems to need an annunciation from Gabriela, a friend living far away, who she depends upon for verification that something can still happen, that the world is still full of the possibilities they imagined as girls. To me, this poem raises the question, what is Mary without the annunciation? Quite possibly, she is just another woman. I love that poem’s directness. It is a quality that resurfaces various times throughout the collection, expressing moments in which the speaker reaches out most vulnerably for affirmation or comfort, and I started to savor them more and more as I went along. I have not done this collection justice in exemplifying the variety that I mentioned at the beginning of my review–that can only be observed by cracking it open yourself–but I hope I have shown some of the books resonance. Ellie Francis Douglass was born and raised in Texas. She studied English Literature at St. Edward’s University, where she studied under the poet Carrie Fountain. She is now getting her Masters in Fine Arts degree in Creative Writing at Oregon State University in Corvallis.